2. Even as Jesus rose from the dead, so we shall rise again. This is a dogma of our faith. "I believe ... in the resurrection of the body." When Job was seated on his dunghill, his body rotting with leprosy, deserted by everybody, scorned by his wife and reproved by his friends, he found comfort in this great truth. I know that my Vindicator lives, and that he will at last stand forth upon the dust where I myself shall see, and not another-and from my flesh I shall see God: my inmost being is consumed with longing (Job 19:25-27). 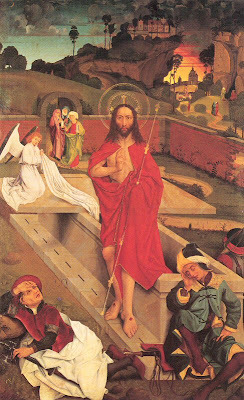 St. Paul described this resurrection. In the twinkling of an eye, he says, at the sound of the trumpet of the Eternal judge, our bodies will be reformed and will have life again. We shall all rise, but not all in the same manner. The body which was the companion of the soul during our mortal life will once again be its companion and share with it either the eternal glory of Heaven or the everlasting pains of Hell (Cf. I Cor. 15) We shall live forever like Jesus. "I believe in life everlasting," in everlasting happiness in Heaven or in eternal damnation in Hell. This great truth is a warning to us. If we remember it all our lives, we shall not steer our course towards evil and towards Hell, but towards goodness and towards Heaven, where one day we shall come to rest in a land of lasting happiness. 3. Our resurrection must begin in this life, however. Day by day we must work hard for our spiritual resurrection. We should give this matter our special attention during Paschal time. 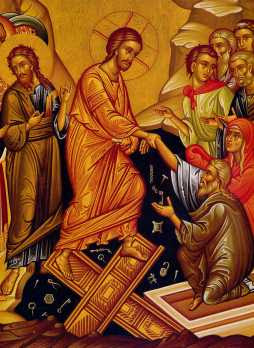 Our resurrection must be real and not apparent like that of many people who celebrate Easter without any sincere intention of changing their lives. It should not be imperfect like that of Lazarus,(Cf. John 11:43) who rose for a while and died again, but perfect like that of Jesus, over whom death no longer has dominion (Cf. Rom. 6:9). In other words, we must rise never again to die in sin, which is the real death of the soul. We must rise also to ascend higher and higher on the way of perfection and to carry out Our Lord's command: You therefore are to be perfect, even as your heavenly Father is perfect." (Mt. 5:48) Our life should be a continual resurrection, a continual ascent towards perfection which will raise us from sin to the state of grace, from the state of grace to fervour, and from fervour to sanctity.